One more time I, Lillooh the white Xweetok, am going to explore Neopia’s wildlife! This time, you can join me in the Haunted Woods, where I will explore the fauna found deep in creepy dark forests and fearsome graveyards! Beware, this is not recommended for the tender-hearted! Walking in the path of my mentor, Lilian Fairweather, I invite you to join me by reading my reportage on the field, one day at a time. Please note: This article is following the Lost Desert Exploration – Dune Fauna article. I suggest you begin by reading the other article before continuing with this one. After the overwhelming heat of Lost Desert, I needed to find someplace a bit cooler, so I decided to travel north along the Neopian Mountains (called Neopies by the locals, but don’t confuse them with the awards!) until I reached the Haunted Woods. But I just couldn’t come in the Haunted Woods without stopping by Neovia first, so my exploration will begin there. Neovia is a quite new village. Well, it’s pretty old actually, but it is a newly-discovered town. Elizabeth, the crumpetmonger, makes the best pastries I’ve ever tasted (no offense to the breadmaster from the bakery in Neopia Central) and is famous all around Neopia. So while I’m here, I decide to stock on yummy delicacies. While I’m strolling among the rows of pancakes and strudels, I hear a gurgling noise in a corner. I notice a row where a small display of scones fell on the ground. The floor is covered with a slimy mixture... Suddenly, a Dribblet shows up from under the pile of scones! I call Elizabeth, and tell her about the thing that’s digesting her pastries. She takes a broom near her and drives the thing away from her masterpieces and cleans the mess. Dribblets are tongue-like Petpets that secrete mucus that can digest surrounding food, just like our saliva does. The food is then discomposed into simple nutrients that can be easily absorbed by the Dribblet’s porous skin. Unfortunately, they are attracted by sugar, so they sometime sneak in shops or ruin picnics. I buy a caramel apple bundt cake, an apple tart, and three apple strudels (what?! I love apples, I don’t know why...). The crumpetmonger wishes me good luck on my journey and smiles warmly at me as I leave. After the bakery, I aim for the tailors’ shop across the town. While walking on Neovia’s streets, I noticed several piles of bubbling mud here and there. I decide to investigate one of them. Well, what a surprise when I see two big eyes staring at me from the middle of the pile of mud! It’s actually a Sludgy! 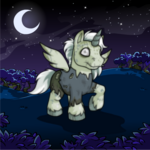 Sludgies are Petpets that look like... well, sludge. They stroll around inhabited cities and villages from the Haunted Woods and eat everything they can find. It might seem disgusting, but it’s actually useful. Without them, the streets would be clogged with fallen leaves, food waste, and all the trash that is thrown away on the street. You really aren’t conscious of all the things that are left out in the street every day. You would if they would just accumulate until you couldn’t walk anymore. But Sludgies are right there, sweeping subtly behind us. So, even if they are repellent, dripping and stinking Petpets, the villagers tolerate them. I arrive to the tailors’ shop a few minutes later. While admiring all the vintage clothes and trying to decide which one suits me the most, something falls from the ceiling right on my muzzle. I see a huge black monster and begin screaming and moving my arms around to get it off me. Prigpants, one of the owners of the shop, tries to calm me down. After taking my breath, I feel a bit ashamed when he shows me the innocent little Aboogala that looked like a giant on my muzzle. Swolthy comes nearer and explains that they will soon release a new line of clothes made of Aboogala’s web. I shiver at the thought of wearing clothes made of web. It would feel like being trapped like a Petpetpet! Only Haunted Woods dwellers could have such an odd idea. But I must admit that, unlike Spyders, Aboogalas can be easily domesticated. They are not aggressive and can easily live in groups, whereas Spyders would just fight each other. The web they build to catch their prey (usually Moffits, Moquots, Bumbluzes and other flying Petpetpets) is made with a light and elegant yet strong string. I choose a cute red coin purse and buy it. Before I leave, I wish good luck to the tailors with their project. Shopping and visiting Neovia took me all day! Still, I encountered some bizarre creatures from the Haunted Woods, so I guess I didn’t waste my time. I find a clear area near the village, set up my tent and sleep until morning. I wake up after a good night of sleep. Since I’m near the Gypsy Forest, I decide to go through it to reach a cave that should have very interesting specimens to observe. After walking a bit, I notice Slorgs in some trees, high over my head, munching on the few leaves still left in the trees. Woods here aren’t like any other woods in Neopia. It’s like eternal fall here. There are no leaves in the trees most of the time, because Slorgs and other rampant creatures eat them as they grow. Even if there weren’t any Slorgs, the lack of light makes the tree shed their leaves perpetually. Many of you may think that the cold that makes the trees lose their leaves in fall. It’s actually the fact that the days are getting shorter and shorter, making it useless for trees to keep their leaves. Since the leaves are used to make food with sunlight (called photosynthesis, just like Kelps in Mystery Island, remember? ), it’s not worth it to keep them during winter. They’d instead lose all their water through evaporation. So they lose their leaves. Well, in the Haunted Woods, days are always short. The huge Neopies on the West makes the sun set early, sometimes even as early as noon, every day. And thus, forests stay leave-less most of the time, which contributes to the eerie reputation of this world. So now you might wonder how the trees can survive. Well, they usually don’t. The woods are mostly composed of dead trees and shrubs. They offer shelter for a great biodiversity, though, and once they are completely discomposed, it is really easy for new trees to grow on the fertile ground... until they die from lack of sunlight. Since the flora is not very diversified and dies really fast, the fauna is mainly composed of carnivores (Petpets that mostly feed on other Petpets) and scavengers (Petpets that are feeding on carcasses).There are a few species of herbivores (Petpets that eat plants) but they are usually small and have the ability to easily hide in their environment, and thus they are rarely seen, since carnivorous Petpets are in too great a number. I continue my walk and soon I get lost. I thought that cove was nearer than that... but apparently, it’s not. Or maybe I took the wrong turn? Maybe I was supposed to turn left after the fallen trunk with a huge red mushroom? I decide to climb a tree and sleep there. If Werhonds smell me, at least they won’t be able to reach me. I fall asleep after making sure I won’t fall. In the morning, the fresh air wakes me up. I decide to continue walking around, hopefully to find my way. I can see better now that the sun has risen again so it shouldn’t be too hard. While walking, I hear a wind sound over my head. I look up and see a cute little Calabat landing on a branch. Calabats are Petpets that use their ears as wings. They cannot fly, but their ears are so huge, they can glide from tree to tree. It can be really useful when you’ve got a pack of hungry Werhonds following you. Calabats might come after you unexpectedly and scare you, but they are inoffensive. They eat fruits from plants, mostly apples, but also berries and they sometimes even try to steal a few pumpkins from farms surrounding the forest. Since fruits are pretty rare (like leaves), Calabats must be able to cover a large area in a short amount of time to gain a sufficient amount of food. That’s another reason why their ears are so useful. After a long walk, I finally find the cavern I’ve been looking for. I knew it was around here somewhere. I carefully approach, aware that the dark entrance could hide some ferocious Petpets. A little branch cracks under my foot and suddenly I’m drowned in flapping wings. I quickly crawl to the ground until the creatures are all gone. It seems like I scared a flock of Batterflies. Those are bat-like Petpets that live in large groups inside caves during the day and go outside to hunt during the night. They are the little cousins of the Bazatlan we’ve seen on Mystery Island. They both use echolocation and eat Petpetpets at night. But Batterflies live in caves since the leaves-less trees here don’t offer much shelter. With all this, I didn’t notice it was getting late. The sun is set most of the day, so it’s really hard to tell... I should sleep a bit before entering that cave, then. I climb up a tree again (better safe than sorry!) and fall asleep. I wake up early, to be able to enter before the Batterflies come back into the cavern. The cave was wet and full of glowing mushrooms. Those are pretty but they are also poisonous, unfortunately. Only a few Petpetpets, like the Rainblug, can eat them. They can digest the poison to make it inoffensive. I carefully walk through the cave, trying not to slip on a mossy rock or put my paw in an Aboogala’s web. After an hour, I finally see the daylight at the end of the tunnel. The cave ends near the entrance of a graveyard. Let’s explore it; there might be interesting thing living there. The graveyard is surrounded by a high spiked fence. Next to the doors are two frightening gargoyles. When those two gargoyles begin to move as I approach, I realize that they are in fact Chumablahs. 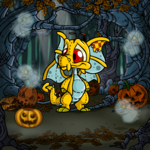 The Chumablah is a spooky Petpet that looks a lot like a gargoyle. In fact, gargoyles are inspired from those Petpets. In the ancient times, there often were thieves sneaking in graveyards to steal the treasures buried within tombs. The poor families found the tombs of their beloved ones robbed from their precious souvenirs. But it was noticed that thieves were too scared to enter a graveyard when there was a Chumablah around. So it has become a custom to sculpt those Petpets at the entrance of graveyards to scare thieves away. Though they might look dangerous, Chumablahs aren’t really that aggressive unless you directly threaten them. I try to avoid them and enter quietly the graveyard. The tombs inside are all solemnly aligned and suddenly it gets colder. My view gets all blurry and... orange? Oh there’s a Goople in front of me! The Goople leaves crackling as I stare at it, surprised. 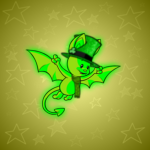 The Goople is a mischievous Petpet. It is born from the gazes that form while organic matter is discomposed. It is common in graveyards, obviously. It likes to scare pets away by pretending it is a monster or a spirit haunting living pets. Well, I’ve had enough emotions myself. I think I’m going to end my adventure here. I hope you’ll read my next adventure, faithful readers! They say that Halloween is when the forests teem with the dead, with the undead, with those like me.